Her children taught her the greatest lesson of all: we have power within us to thrive, despite everything, even in the face of our darkest days with chronic illness. We live in such interesting times, don’t we? It can kind of shakes you to your core, if you let it. Our kids give us a lot of perspective, don’t they? You are going out into this big, big world one day and the filter you have about it, is either going to set you up to win or set you up to lose. And we feel that responsibility, because even though we know we can’t control everything that happens out in the world, we sure can put on our best lens about how to see it. But you probably already know that, because you’ve already had to do that. 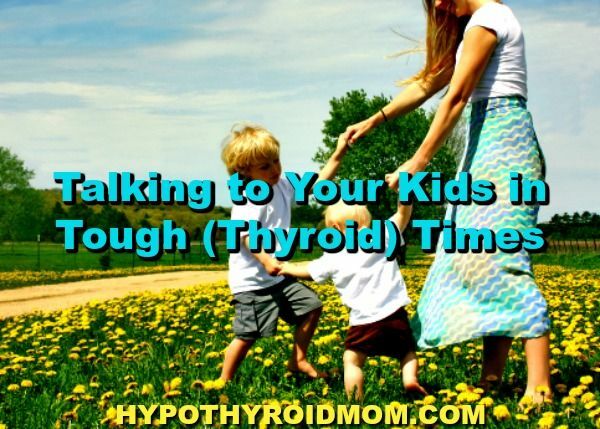 My kids didn’t exist when I was misdiagnosed and then, eventually diagnosed with Hashimoto’s thyroiditis. I was 27 when the symptoms of hypothyroidism hit hard: hair falling out, skin freaking out, cold hands, feet, and rear-end, foggy brain, gaining 100 pounds – yes, you read that right – and so much more. I slept night after night in my car in the parking lot of the ER because of the problems with my heart and I was told I had a brain tumor, that my absorption issues were worse than the starving women in Africa, that I was dying and that if I did live, that I would never, ever have kids. Having kids while in a world of thyroid bad news and fears; ideas and opinions, past experiences and future worries required that I reframe thyroid disease for them so that they weren’t completely bummed out and burdened. And as a result, I did it for me. You know, many of us with health issues came from hard or stressful backgrounds. Sometimes the only time we got compassion or a break from abuse was when we were sick. Sick can become like the homebase in baseball — the place where we’re safe and no one can tag us out. I needed to learn how to say what I wanted and needed. To represent myself. They were 2 and 4. “Quiet” wasn’t in their vocabulary. My husband kept saying it over and over again, “Mom’s sick.” He’d say it when I was tired, when I was cranky, when the place was messy, when I was in my room instead of out in the mix. I thought: I don’t want to hear that anymore. And I don’t want them growing up thinking that their mom is sick. That’s not how I want them to think of me. And oh my gosh… the energy and love is so different around, “She’s healing” because kids feel excited about participating in that. Boys are busy. And I don’t know how the math works out this way, but having one boy was a lot (because it’s such an adjustment) but having two boys was like having 23 monkeys. Who’s trying to feed their brother the little pellets that come in the little packet that you find in a box of shoes to keep them dry. Which is mom code for: RUN OUTSIDE RIGHT NOW AND LOOK AT THE ROOF! STAT!!! You know, because your 3 year-old is standing up there with an umbrella like Mary Poppins to see if he can jump from your roof over the neighbor’s fence so that he can pet their dog. So, they would want to play. With me. I was their “Homeschooling Momma, Full-time Play Mate, Isn’t She So Cute, She’s Our Momma, Plus She Feeds Us” buddy. They wanted to jump and run and ride bikes and boogie on down the street. I was so. Freakin’. Tired. The boys were so open to gentle play! Thank. God. Hoo-boy… have you discovered the power of a balloon? Now, first of all, let me say this: I come from a freakishly, over-protective family. Balloons were the reminders that a child could eat one, choke, and die. They are not a “happy part of the circus” kind of memory for me. BUT, for some reason, people LOVED giving my kids balloons so we often had one in the house. Because I was able to lie in bed, propped up on pillows and hit that thing from one corner of my room to the other, where Seth would just run back and forth, hitting it back to me and giggling like a crazy person. He was so happy, he’d get sweaty and I pretty much only had to lift a finger to tap it and know that I was bringing him SUCH joy. We also had one of these soft pom poms that my youngest had made. It was safe enough to toss around without fearing for lamps, vases, and wall hangings. You can learn to make one here. And instead of the, “No, I’m tired” I would give options and focus on what I could do. The kids loved two things: Being with me and having a choice to pick something fun from the list of options. Options make them feel powerful and sharing time with mom makes them feel loved. This was hard for me sometimes, because I so want to be a “Yes” to my kids but the truth is this: Being a self-employed momma and significant co-provider to our family meant that when I was too sick to work my business, the finances changed dramatically. Thyroid disease hit a weird iteration in 2010 and I ended up dizzy for up to 15 hours a day. I was the color of school glue and my eyes shook back and forth. I could barely function to make breakfast let alone speak or sing at events, teach, or write. I would sit in a chair for most of the day and pray to not die. It was scary. My husband had started a new, entry-level job and it covered the rent and one week of bills. After that, we had nothing. Our savings had been spent on the last big move across country and we were starting over back in California when this health crisis hit. We had always made it through tough times before because I have a super strong work ethic and always pushed to work hard, but this dizzy thing meant I couldn’t drive and I could barely walk. So, those other two weeks of the months, I found myself in the very humbling position of standing in food lines with my kids. They’d ask me if we could go some place for fast food or buy a toy or go out to a jumping house place that cost a bunch of money. I remember scouring for the free events or experiences where you could donate clothing or books (we always had a lot of those) to give for the entrance fees to the county fair or a concert. There were always reading or craft days at the library or a section in the toy store with a bunch of toys to try. There was always a yogurt place or three that would give generous tasters, or a bakery with samples, or a free candy at See’s Candies in the mall — and for little kids, that felt like a whole lot of joy. Do I wish I could have given them more during that time? Yes. Especially the basics like new shoes for growing feet or jeans without holes in the knees… But my boys have the most beautiful perspective and gratitude for what they have in life. They didn’t get that way by me complaining about the situation we were in when they were little… it came from having those humbling, honest conversations with them that we reframed in an empowering way. They became so good at it themselves that they turned the table on us. Nathan and his dad really loved talking about money and so did Seth, my little wanna-be-businessman. And I pulled him close to my side and said, “Yes, Seth…” Because I couldn’t have given a better answer to my 6 year-old son — and I don’t think he could have given a better one to me. We all have some idea and ideal of who we want to be as a mom so when our expectations collide with reality there can be a lot of guilt, regret, and a strong sense of failure. None of those feelings are going to serve us in being a better mom. And none of those feelings are going to serve us in having better health. Even though I raised my kids without a TV in our home, there were days I pulled out the computer, turned on a cooking show or Word World and climbed in the tub. Even though I wanted my kids to eat only organic foods at every meal, instead we gratefully ate the food that was bought on food stamps and taught my kids, yes, to choose wisely, AND that the power is in them to bless whatever is in front of them. Sort of like us — with whatever is going on in our health. Our health condition and our kids give us some of the greatest opportunities to see the greatness that lies within us and within our circumstances. We are resilient — we can get back up again. We are resourceful — we can use everything for our good. We are the alchemists — we can turn this hard thing into gold. Sometimes, reminding others of our power, allows us to remember too. Go, be kind to yourselves, Mommas and go love on your kids. They are such a gift to your healing and you are such a gift to their lives. Stacey Robbins is the award-winning author of You’re Not Crazy and You’re Not Alone, and An Unconventional Life: Where Messes and Magic Collide. She coaches clients internationally and leads boutique retreats in Italy and the U.S. Her husband, Rock, is the author of The Guys’ Guide to Hashimoto’s, a book for the guys who don’t understand and the women who wish they did. They live in Southern California with their two amazing teenage sons, Caleb and Seth. READ NEXT: MARRIED TO HASHIMOTO’S: WHERE’S THE WOMAN I MARRIED?